You are currently browsing the category archive for the ‘shop samples’ category. Catch-up part 5…we’re almost done! If you love it, you will save it. Every bitty piece of the line! This is not a typical trait of mine but I’m so glad that I did just that with Tasha Noel’s Vintage Market line. I mean how the heck can you even discard this cuteness to the trash can anyway!?! It came into good use when I decided to have a sew day with Paige. We worked all day on the Scrap Happy Purse pattern by Crazy Mom Quilts. We had a blast making these! We get so much accomplished during our sew days. I love to try to have the girls over once a month. We usually pick a Saturday and start bright and early, about 9am. I fix lunch, there’s always wine involved, and we usually end with a finished project. I like to keep everybody on track! The only difficult part of the pattern is attaching the handles. It takes time, working your needle through the leather. I’d suggest getting the tool to help with that, which Dritz makes, or puncturing the premade holes in the strap to help your needle slide in and out of easier. 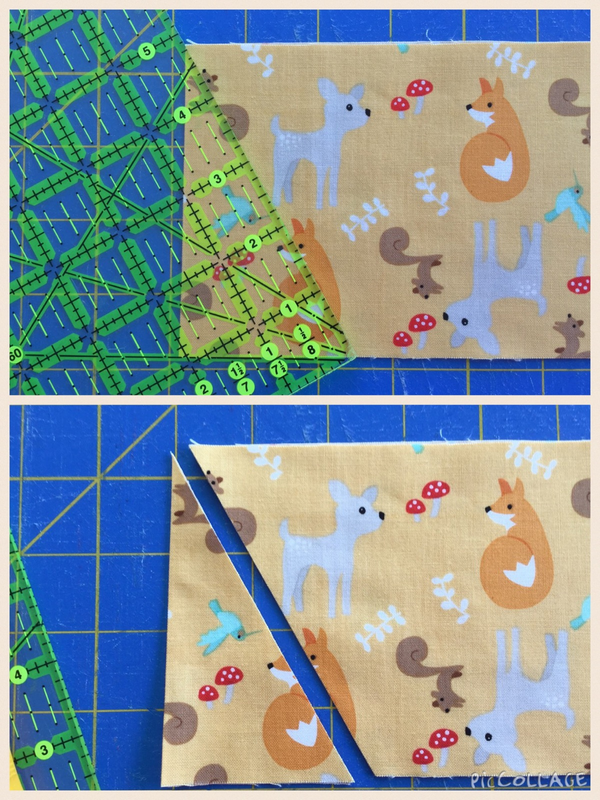 Check out this tutorial on how to use the Speedy Stitcher from Dritz at Sew4Home. This handy tool is definitely on my list to buy next time I come across one. Anyone out there ever use this? Paige decided on a more scrappy look, using up some of her leftover fabrics. The Scrap Happy Purse pattern can be found along with the cute red & white polka dot handles in the SewMod Etsy shop. Sadly, all of my Vinatge Market fabric is sold out but don’t fret, I’m awaiting a new shipment! Now that we’re all caught up from last year, I’m going to try to stay on track. Oh…who am I kidding lol. I knew when I saw this Riley Blake line by Emily Taylor that I had to have it and make something beautiful for us grown-ups! It reminds me of a ‘pretty cowgirl’ with all its florals and weathered pieces. I especially love the blues. It reminds me of a repurposed piece of furniture that you’d find in a farmhouse. And with any pretty cowgirl theme, there needs to be a star design. I chose to make this kit from Lella Boutiques StarStruck pattern. 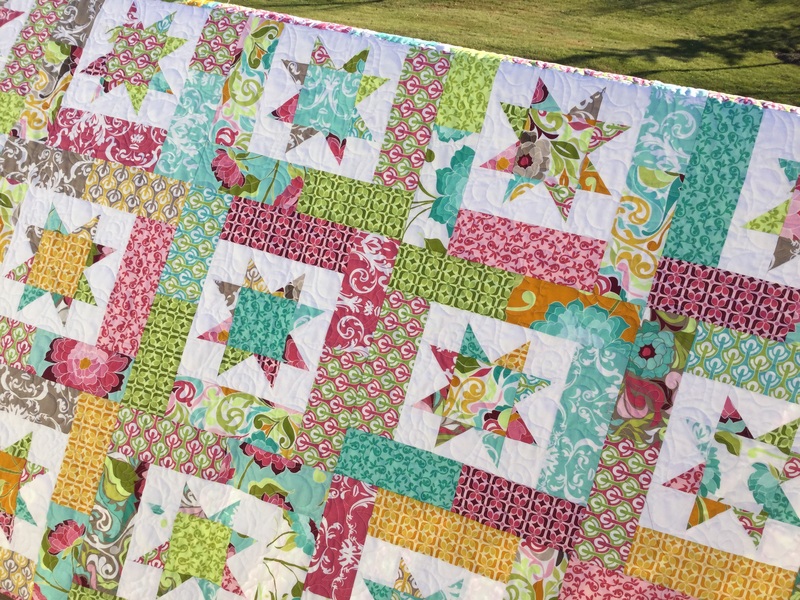 The large and small florals are featured in a star and snowball quilt combination. 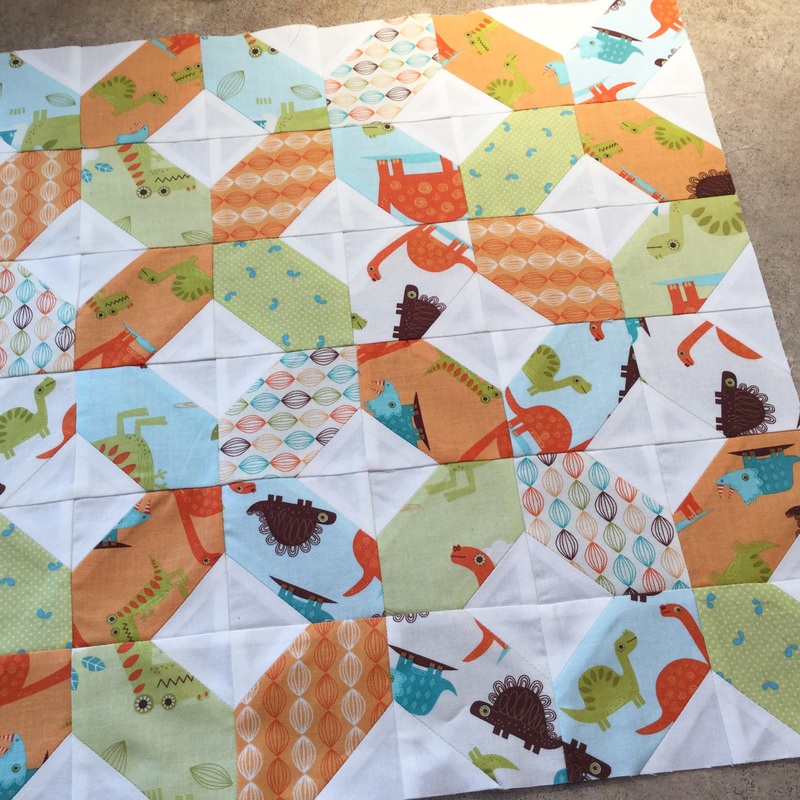 The kit assembles easily because the focus fabrics are precut 10″ squares. Kit comes with fabrics for the top, binding and pattern. Quilt measures 62-1/2″ x 72″. As of now, I have this quilt sample on display, draped over the couch. It makes my heart smile every time I see it! I’m pretty sure this sample is one that will have a permanent home in my house! As of this post, most of the Chatsworth fabrics have been sold. I have kits left and a couple of layer cakes and a FQ bundle along with one bolt of the dainty blue floral backing. If you’d like to check these out you can find them in the SewMod Etsy shop. Are you ready to make pillows? 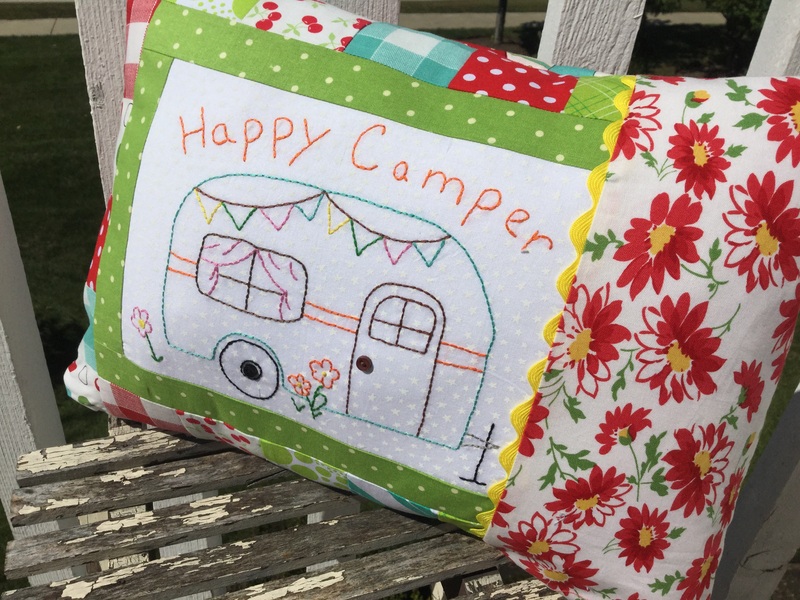 I’m going to show you how to stitch a 3-1/2″ Road To Tennessee quilt block and construct an 18″ pillow cover. Let’s begin! 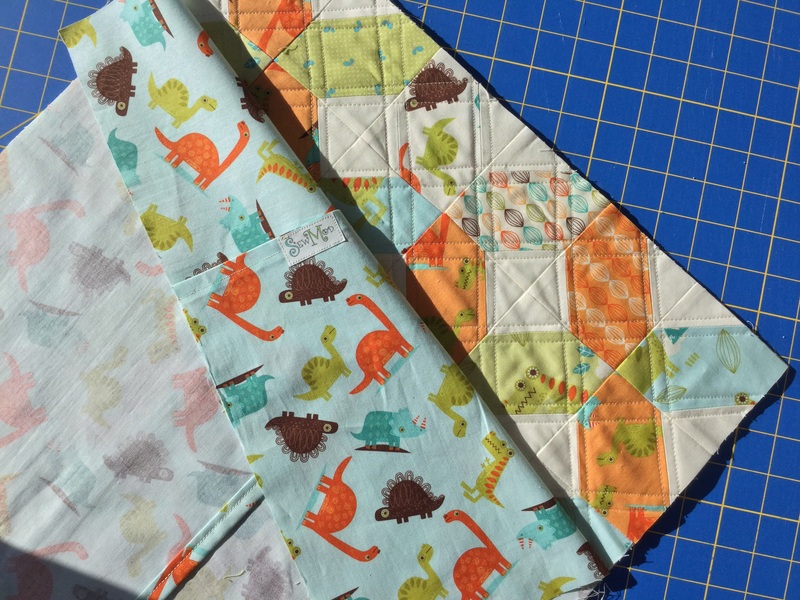 To make each Road To Tennessee block, you’ll need (1) 3-1/2″ Dinosaur square and (2) 2″ background squares for a total of (36) 3-1/2″ Dinosaur squares and (72) 2″ background squares to complete your pillow top. Draw a diagonal line on the back of each square with a pencil. 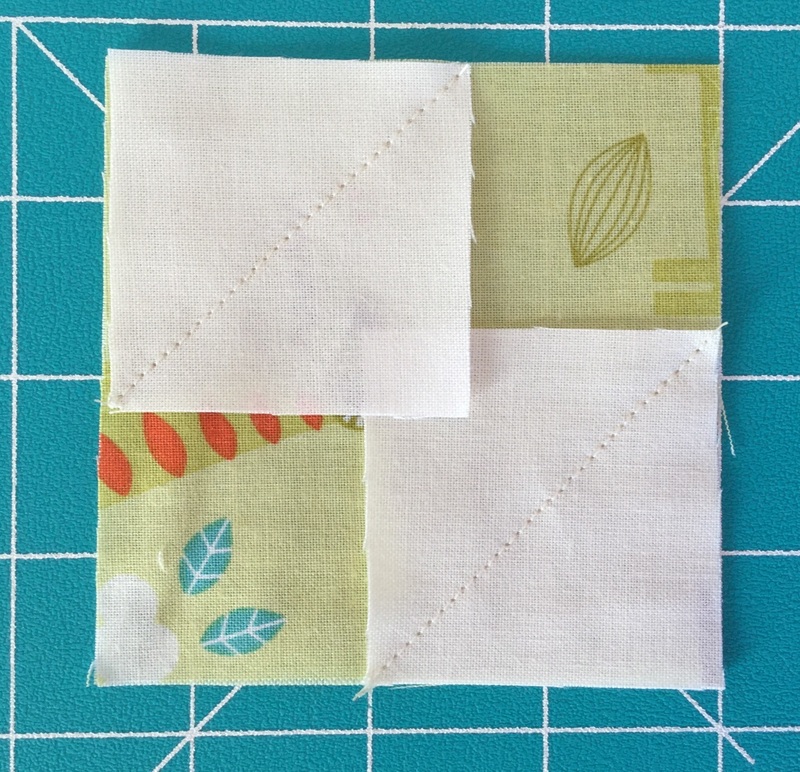 With right sides together, place a white square on each opposite corner of an 3-1/2″ square. Stitch on the line. Trim a 1/4″ away from the stitched lines. Press your seams open. *This reduces bulk and makes it easier to match your seams on this particular block. 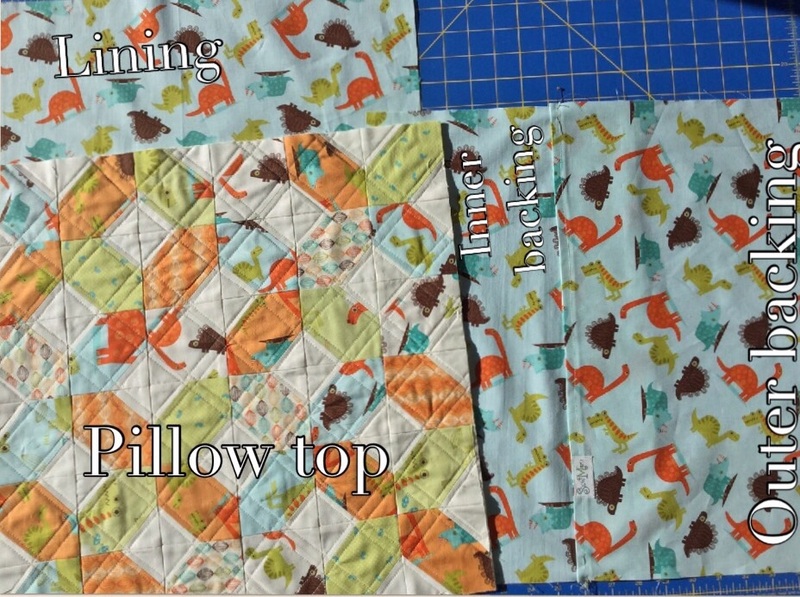 Lay your pillow out in a 6×6 setting and rotate the blocks as shown and sew. Cut a 19-1/2″ piece of batting. This is where all those batting scraps come in handy! 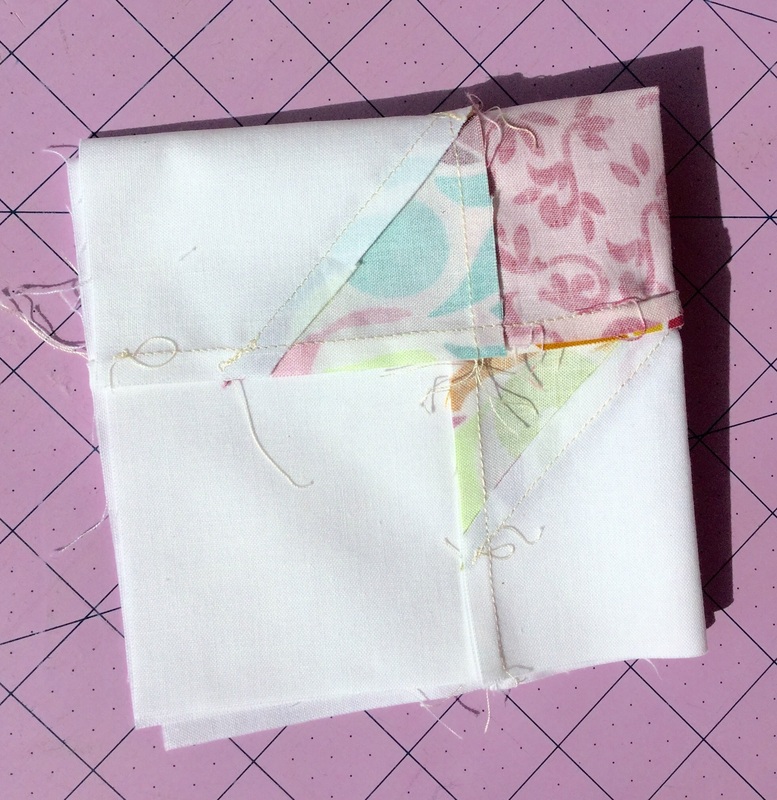 Layer your pieced pillow on top of the batting, pin and quilt as desired. I quilted a 1/4″ on each side of my seams. Trim to an 18-1/2″ square. Cut (1) 18-1/2″ square of fabric. This will be your pillow lining. I use a lining on my custom orders because it hides all of the quilting/threads and batting for a more finished look. Cut (2) 13″x18-1/2″ pieces for your pillow backing. 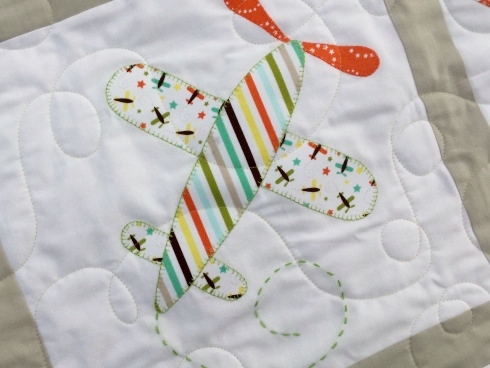 **Place your quilted pillow on top of the 18-1/2″ lining. ‘Square up’ and trim any excess to make them the exact same size. 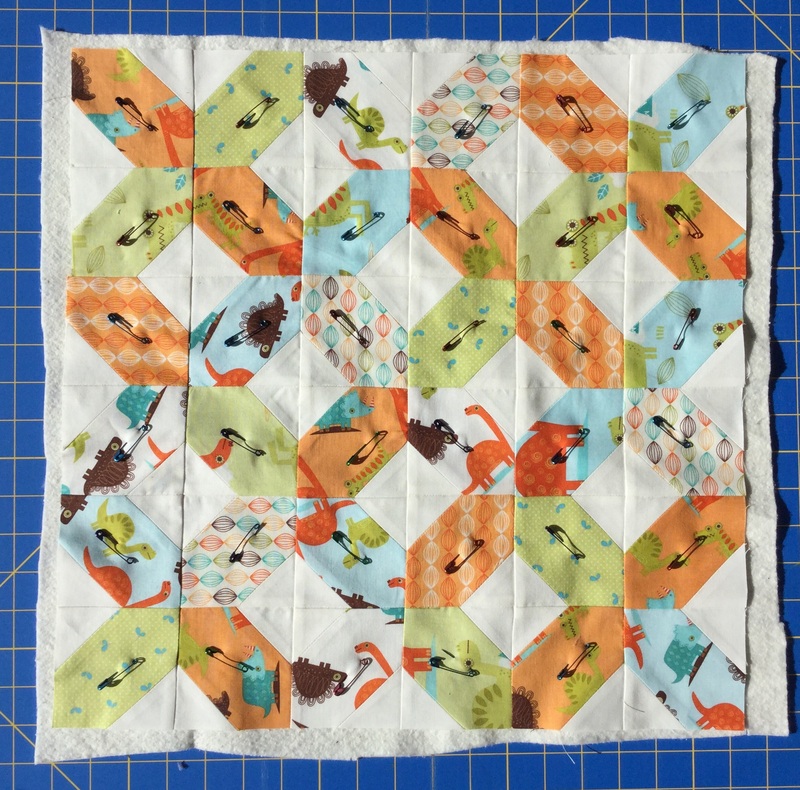 Sometimes after quilting your work, it ‘shrinks‘ a bit, so if your top doesn’t exactly measure 18-1/2″, that’s still ok. Just make sure that your pieces are the same size as your top. This will help when stitching through all of your layers when sewing your finished piece together. For the pillow backing, turn under 1/2″ on the 18-1/2″ long side and press. Turn under again, press and top stitch the hem for each piece. Attach your label now if you have one. I stitched mine on the outer backing part of the hem. You now have 4 pieces for your pillow. 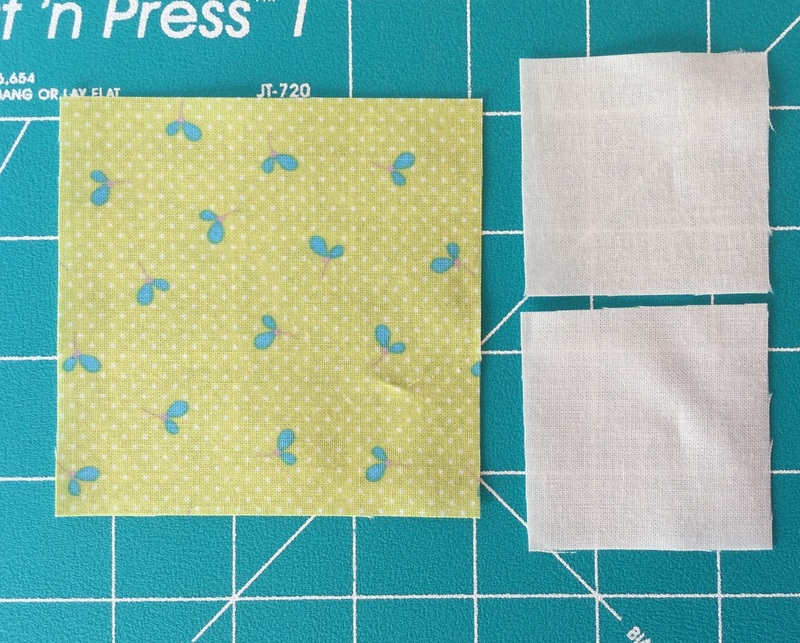 Layer them in the following order and pin, being careful to match all of your seams. Pin well. Pillow liner right side down. 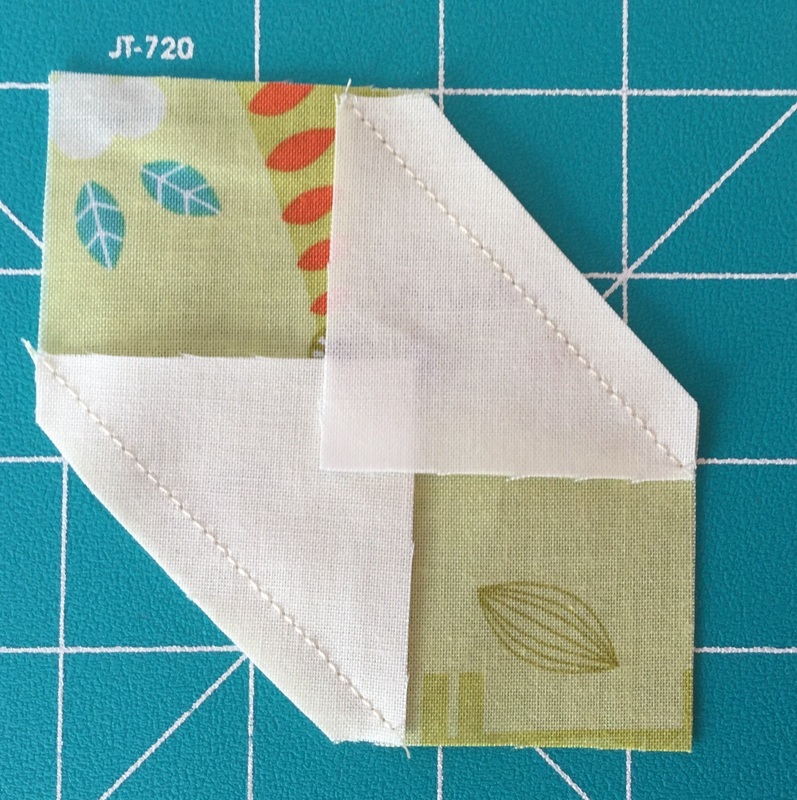 Stitch around your pillow with 1/2″ seam. Clip your corners . Zig Zag around your raw edges to decrease fraying. Turn your pillow cover right side out through the backing envelope. Push your corners out and insert your 18″ pillow form. The possibilities are endless when it comes to these covers. Need a quick Christmas gift? Make them for any holiday. 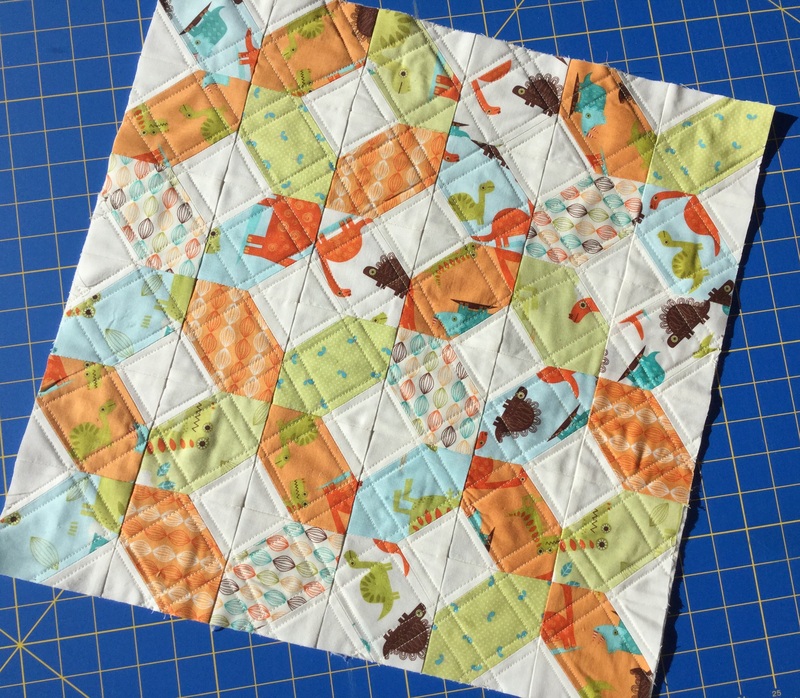 Make them with different 3-1/2″ quilt blocks or how about one quilt block. 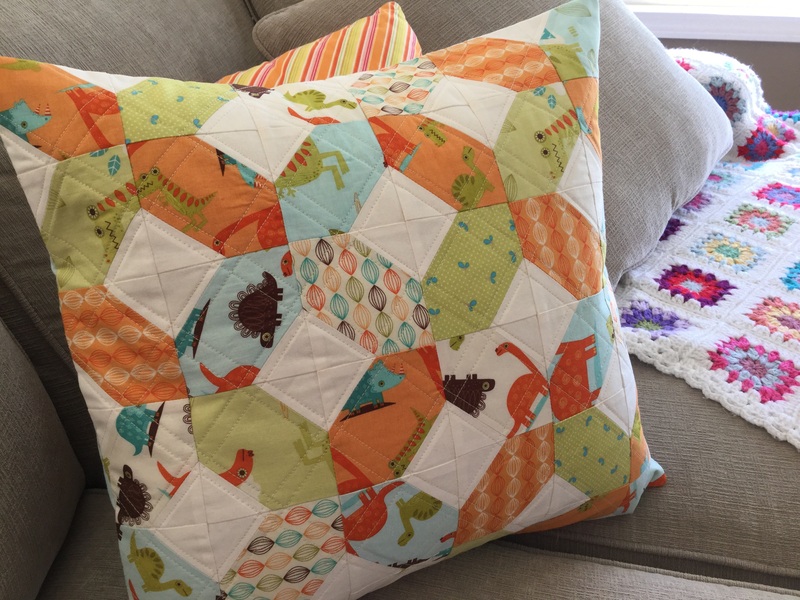 It just needs to be an 18-1/2″ unfinished square to make this pillow! 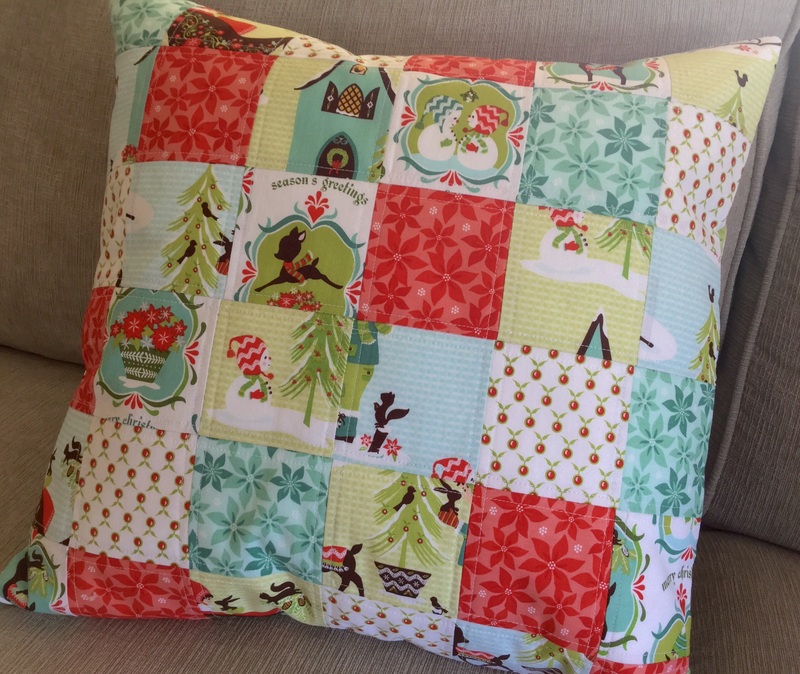 Here’s a patchwork Christmas pillow I made with some of my leftover Alpine Wonderland scraps. Keep an eye on my Instagram feed. I’m sure there are more pillow examples coming this holiday season! 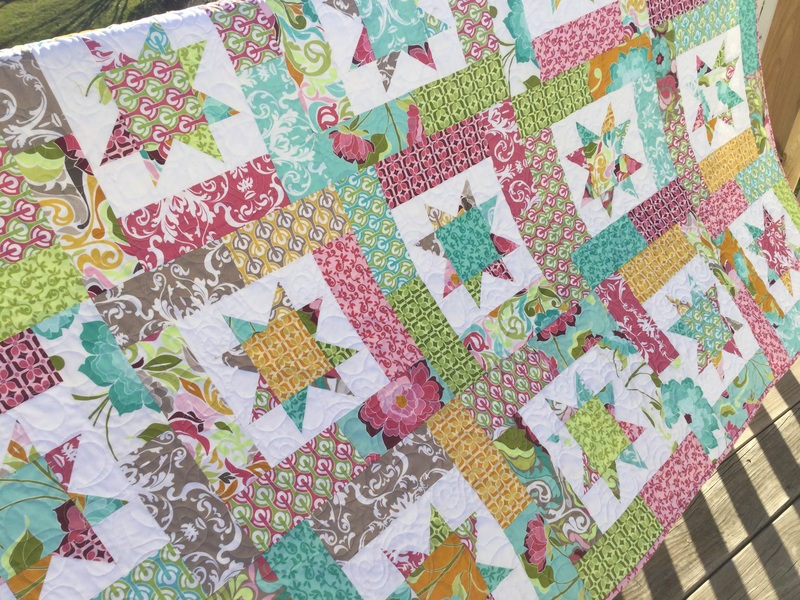 SewMod’s latest quilt kit is made using Lila Tueller’s fabric line Halle Rose from Rikey Blake. It has all my favorite colors…the teals, oranges and pinks of course! I used the quilt pattern from Atkinson Designs called Lucky Stars. You can’t go wrong with this one ya’ll. It’s so versatile. 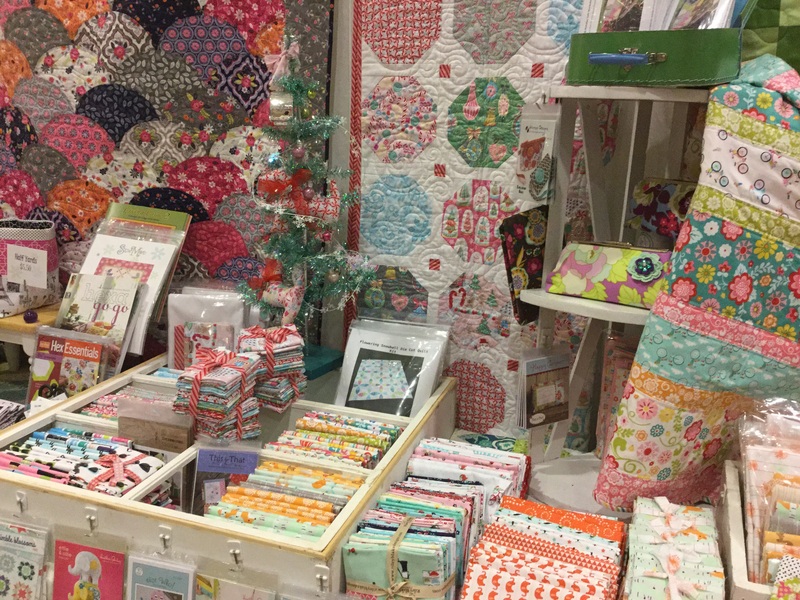 All you need is some background fabric and a bunch of beautiful fat quarters! 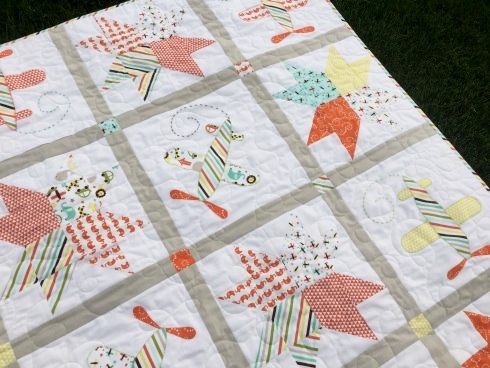 The great thing about Lucky Stars is that you can chain piece almost the entire quilt. I’m not kidding. And that means a quicker finish:) OK, so there’s several great things about this pattern aside from chain piecing…it’s simple with very little seams to match up, an entire line looks and works great with it so there’s no thinking about what fabrics to choose, it looks great with the star points scrappy(like mine) or all the same fabric, and the pattern has all of the different quilt sizes and fabric requirements. That means you can use it over and over. 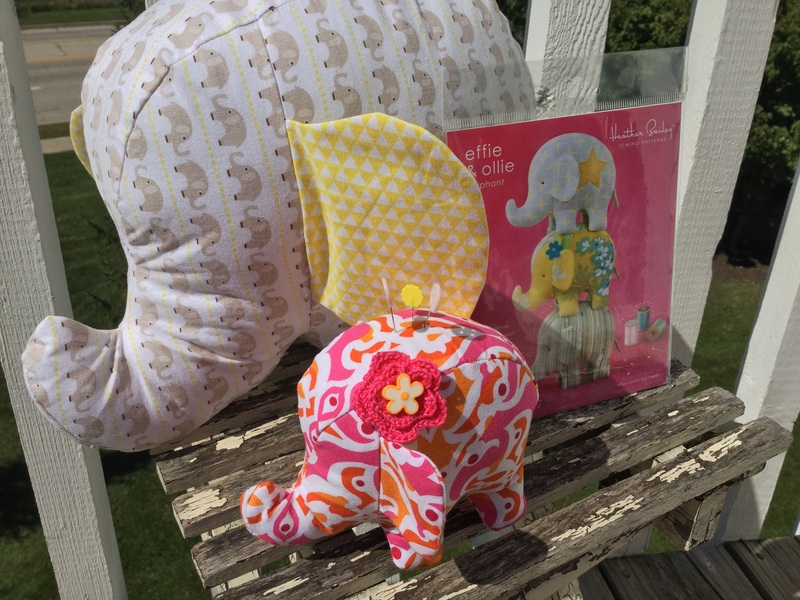 One for baby, one to keep your lap warm and one for your bed! 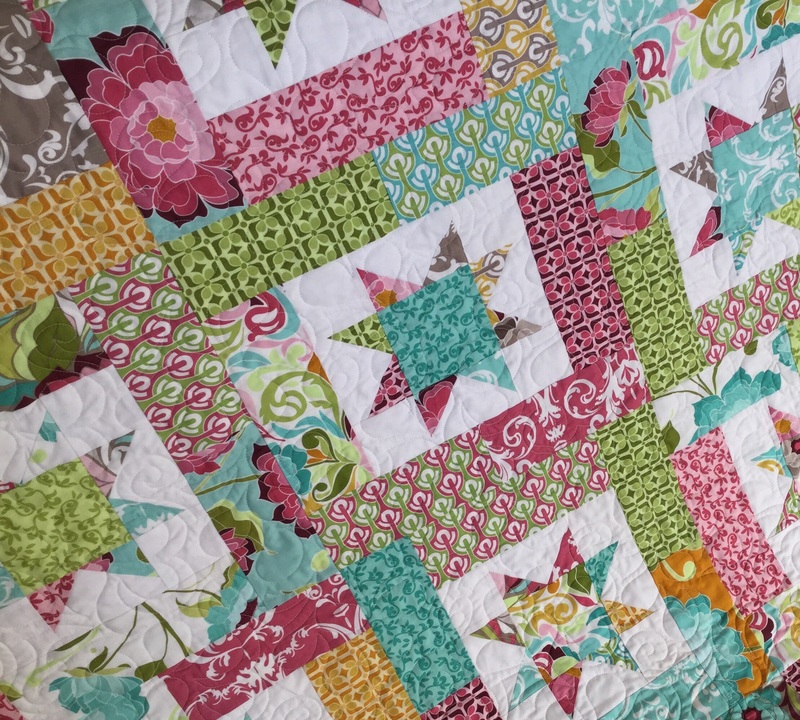 Paige quilted this one in a pretty, all-over design. I do have a a tip & short cut on trimming your blocks down to size. Trimming for me is so cumbersome and it never fails…I always screw up at least one block trying to figure out how to trim without having a lopsided block! 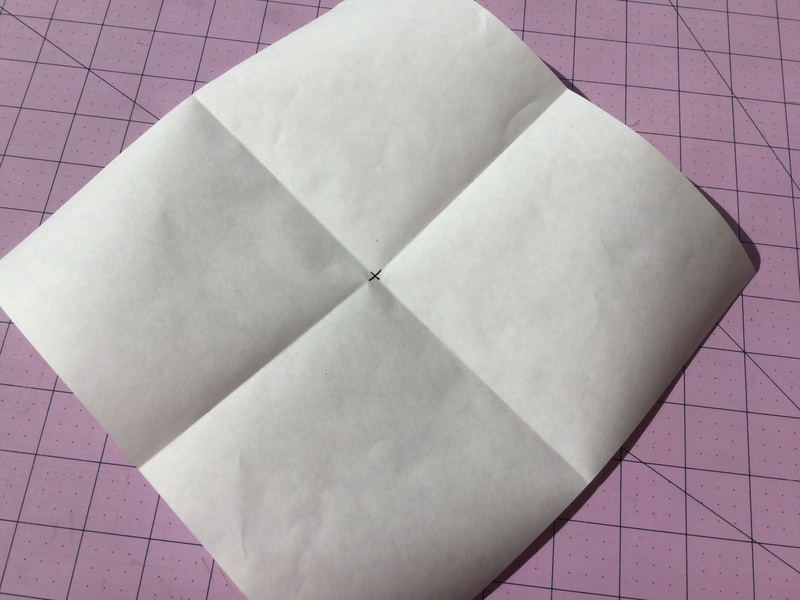 Start by cutting a 9-1/2″ square from freezer paper, fold it into fourths and mark the center with a x. 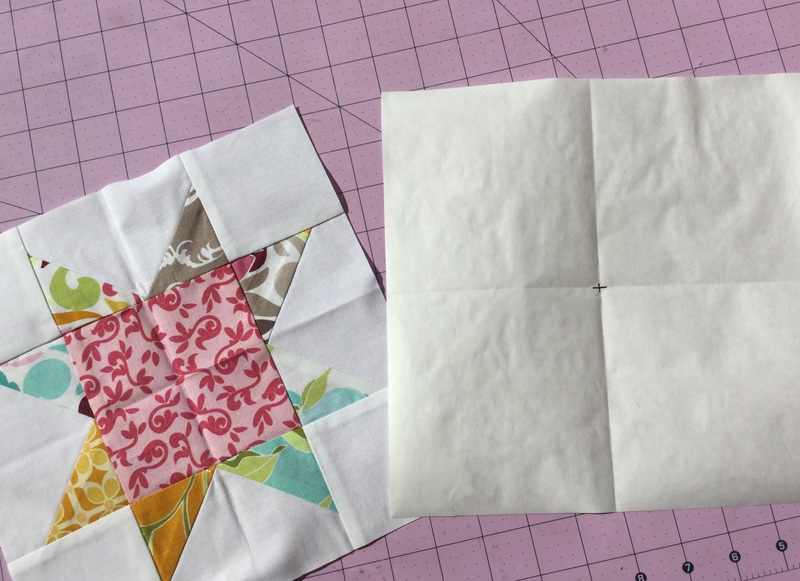 Fold your pieced block in fourths and finger press. 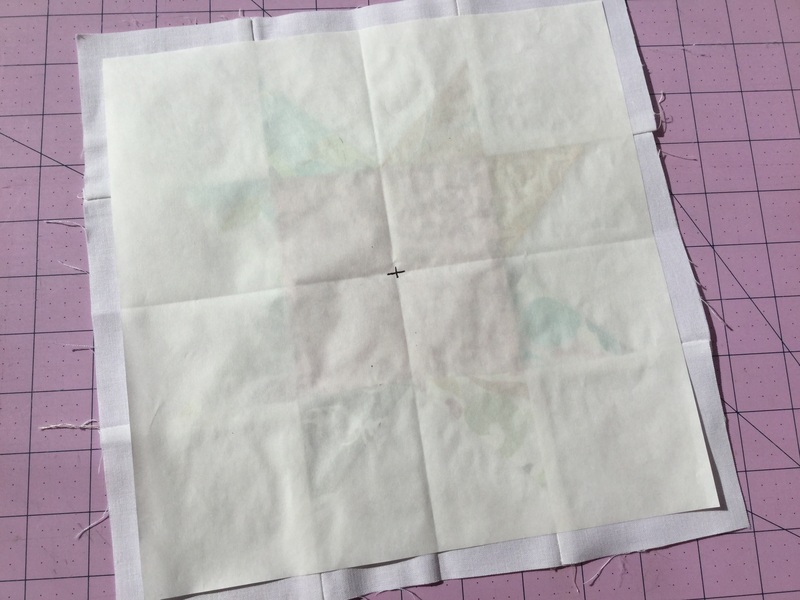 Place your freezer paper on top of the right side of the pieced block, shiny side down, lining up your ‘X’ in the center. Lightly press to keep it from shifting. 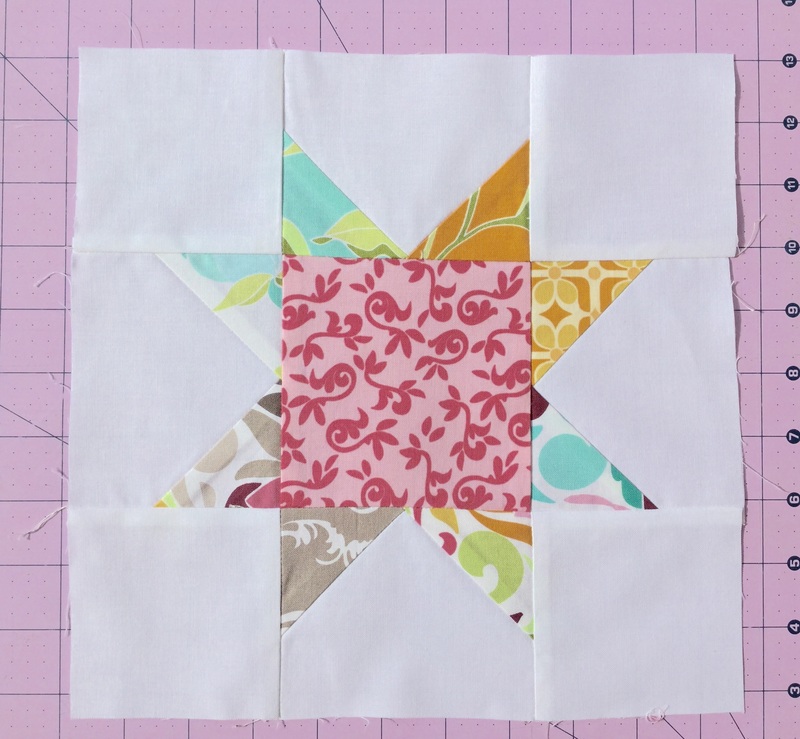 Trim the block using your rotary cutter and ruler to the 9-1/2″ square. 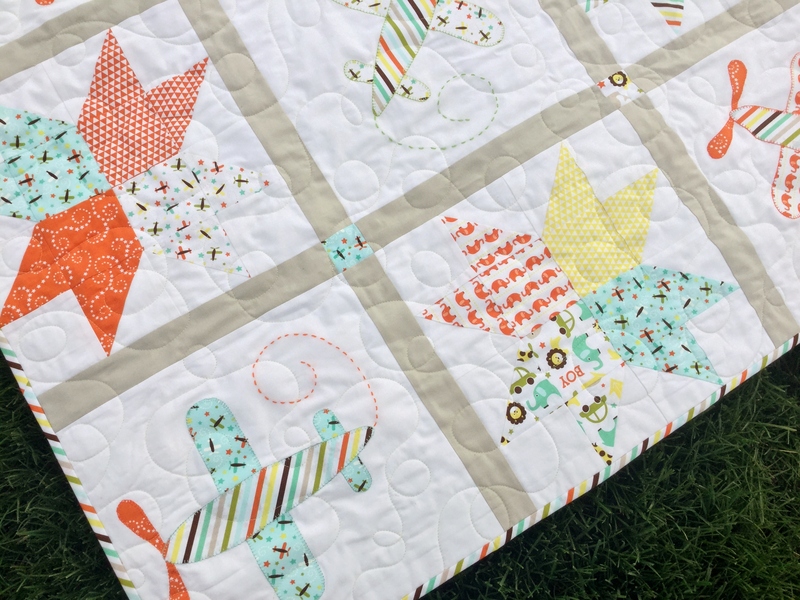 Remove the freezer paper and repeat with all of your blocks. Easy peasy! Perfectly trimmed 9-1/2″ squares. 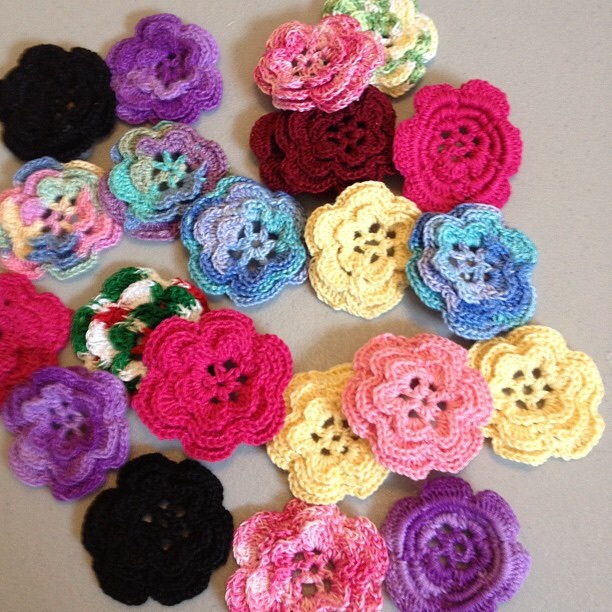 To find the Lucky Stars KIT and/or pattern, visit the SewModDesigns Etsy shop. 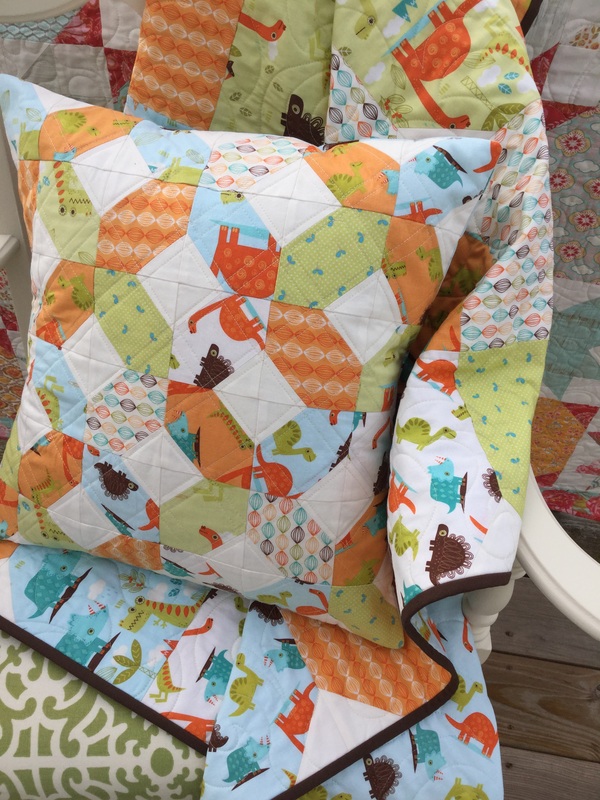 Kit includes fabrics to piece the lap sized quilt top(60″x75″), binding and the pattern, $68.75 plus shipping. There is also yardage available in the shop as well. Equilateral?! Yuck. Geometry. Pretty much the only class I actually cheated in during high school. If I’d only known I’d be doing it as a business and hobby! The truth is, we use geometry & math every time we quilt…hexagons, triangles, squares & fractions. But sometimes we tend to get hung up on the ‘words’ until we’ve tried it. An equilateral triangle simply means that all 3 sides are equal. 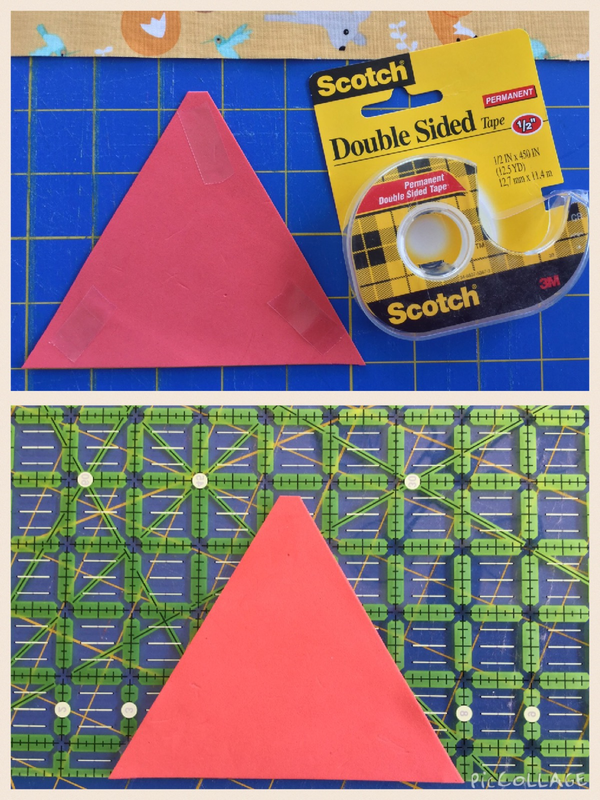 I’m going to be showing you a 60 degree equilateral quilt today with 2 methods to cut out the triangles. 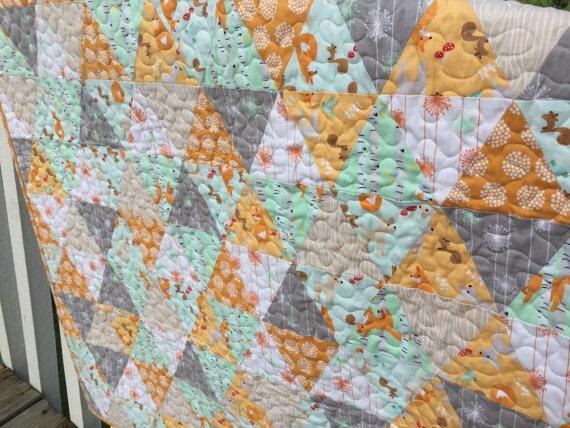 I wrote this ‘little‘ tutorial for a new baby quilt KIT for the shop using equilateral triangles and Riley Blake’s fabric line called ‘Good Natured”. 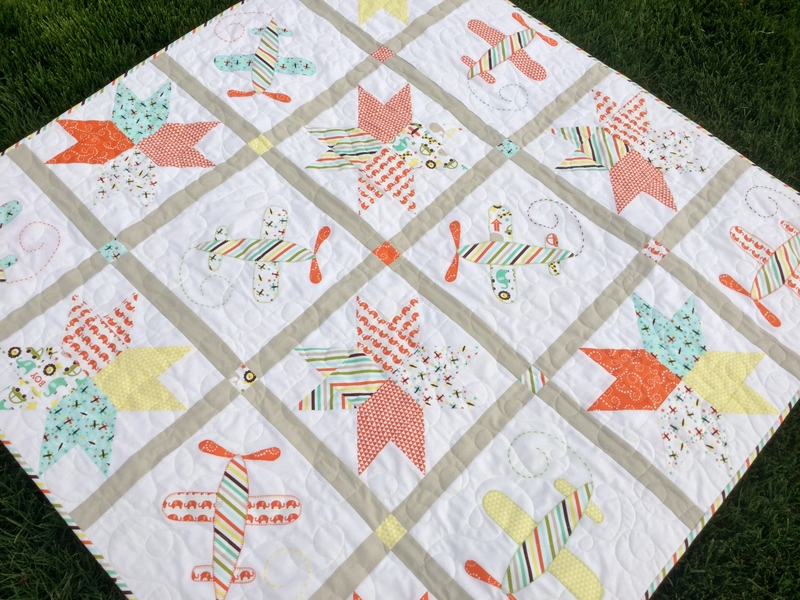 It really is a sweet quilt with the orange & mint…adorable nature friends… squirrels, baby deer, sweet little bluebirds and playful foxes among birch trees! I was both excited and nervous to make something with so many bias edges but it went together beautifully! 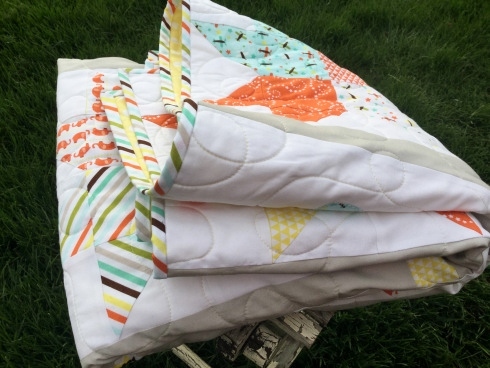 Now that I know just how awesome it was, think of all the scrappy triangle quilts I could make. Oh, if I only had more time! Since I learned a few tips along the way to make this quilt, I figured I’d pass it along to you guys. 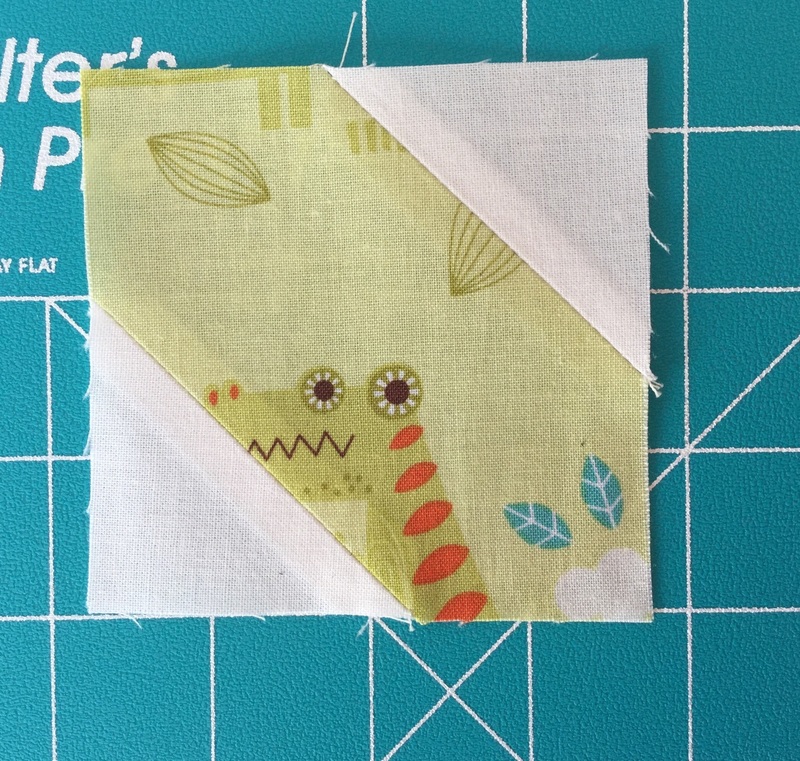 Cut each of your 7 different fabrics into 3 strips of 4-1/4” wide. 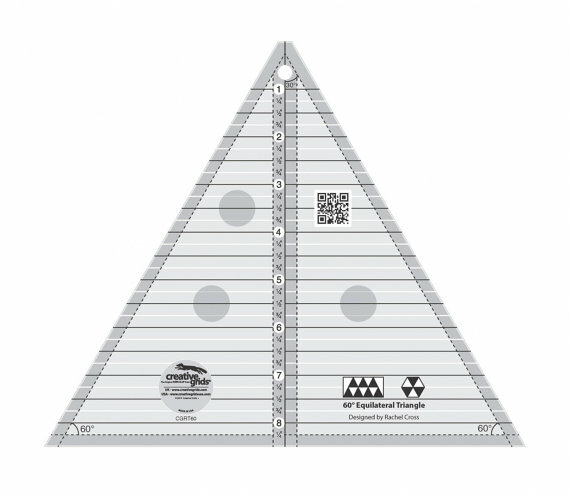 This is the same height as your triangle template or ruler. 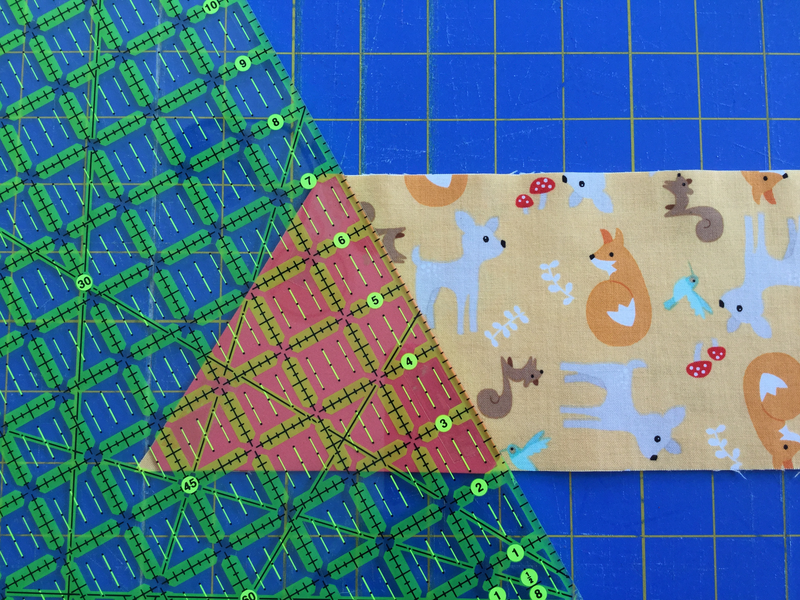 A ¼” seam allowance is used for sewing and ALL seams are pressed open. Do not iron your triangles or rows. This will cause stretching. Press. There are two methods I like to use to cut 60 degree triangles. To make the cutting as precise as possible, choose only one method per project to cut all of your equilaterals. This ruler is found in the SewModDesigns Etsy shop. Place the ruler on the strip of fabric. 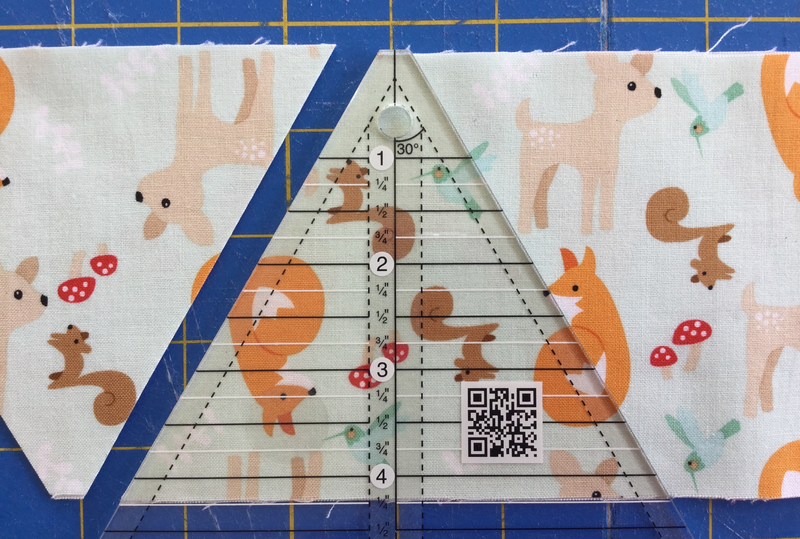 The 4-1/4” mark should line up with the bottom of the strip and the squared off tip of the triangle should line up with the top of the strip. The first thing we need to do is cut a 60 degree angle. Discard the extra fabric with the selvage on it. 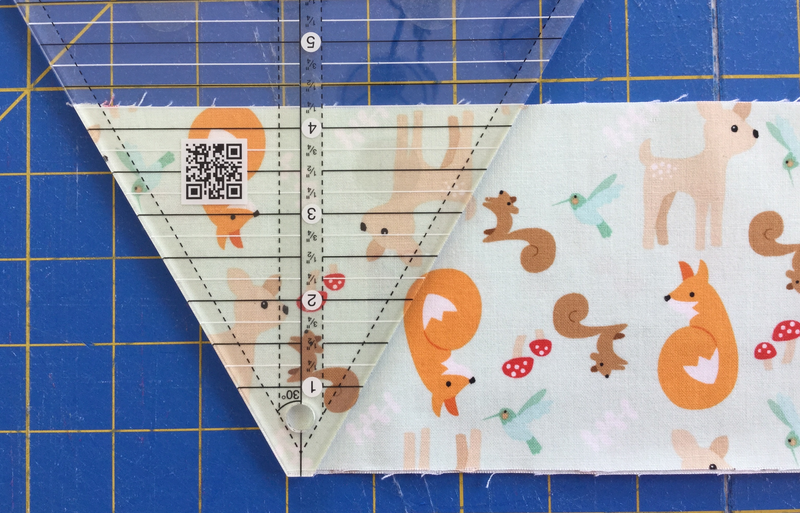 Rotate your ruler so that the top of the fabric strip lines up with the 4-1/4” marking and the squared off tip lines up with the bottom of the strip. Use the edge of the ruler to cut your triangle out. Flip your ruler, line up the markings, and cut again. Repeat this flipping method until you have made 6 cuts with the ruler, giving you 12 triangles per strip. Cut the provided template out onto colored paper. We want it to be colored so that we can see it easily through the ruler. It makes it difficult to see if we use clear template plastic. I used a piece of craft foam for mine. I like the foam because it ‘sticks’ to the fabric while I’m cutting. These sheets can be found at your local craft & hobby store. Place three pieces of double-sided tape to the back of your template. Turn your ruler over to the backside and adhere the template to it, lining up the bottom edge of the template along the side of the ruler. Don’t worry. It won’t leave your ruler sticky after you remove it. The first thing we need to do is cut a 60 degree angle. Line the 60 degree mark on your ruler with the bottom of your 4-1/4” strip and trim off the selvage angle. Discard the extra fabric with the selvage on it. Using the colored foam as the guide, line the foam triangle up with two sides of the strip…the top and the left side as shown in the photo. Cut. Turn the ruler and line up the foam triangle with two sides of the strip…the bottom and the left side. Cut. 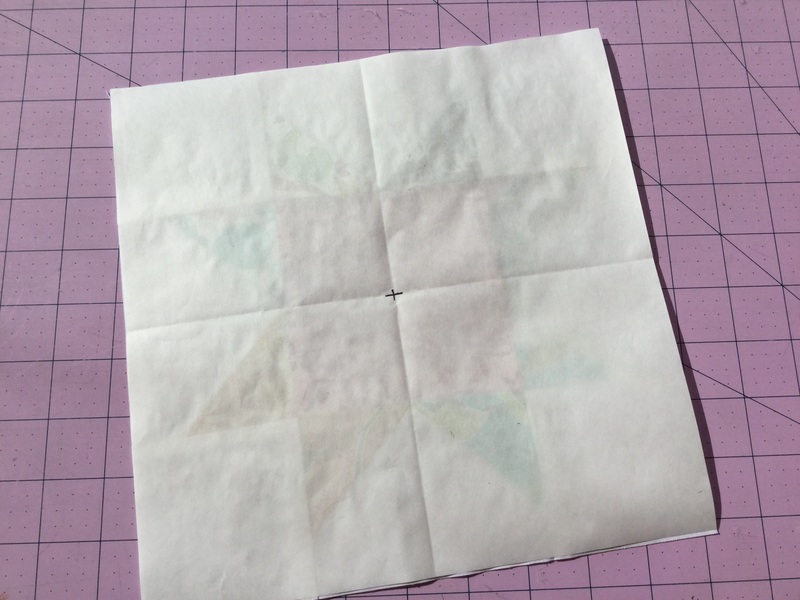 Repeat this turning method until you have made 6 cuts with the ruler, giving you 12 triangles per strip. **All of your triangles have the top squared off. It determines the top & bottom of the triangle and keeps the straight of grain going in one direction for minimal stretching. 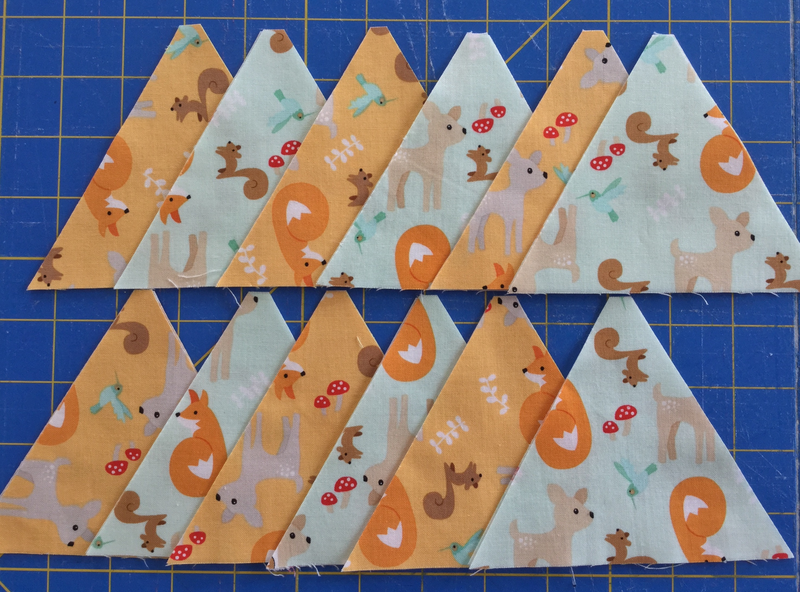 Using your preferred method, cut at least 216 triangles from the fabrics. 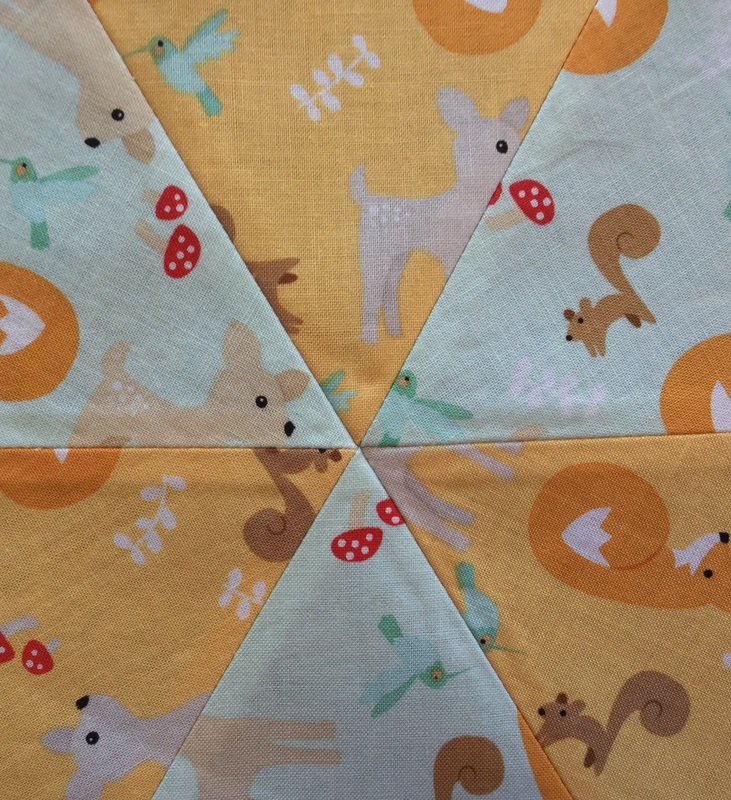 The fabric requirements provide enough fabric for you to cut as many as 252 triangles so that you can mix it up to your liking and play with the placement or make baby a matching pillow with the extras! Lay your quilt out in a setting of 18 triangles across by 12 rows down. 1. Place triangle 1 & 2 of the first row right sides together, matching up the top and all the edges. 2. 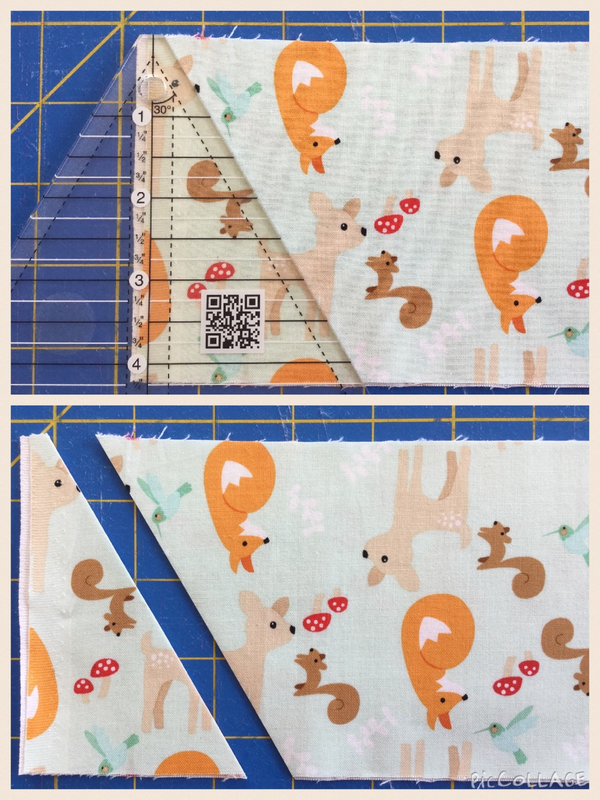 Sew these together down the side using a 1/4” seam allowance. 3. Press the seam open. 4. Layer triangle 3, right sides together, on top of triangle 2. Sew. Press open. Repeat this process until you have 18 triangles pieced together and 12 rows total. Trim off all of the ‘rabbit ears’ and threads. Here are a few tips I use to line up the points on the equilateral triangles. 1. Place row 1 & 2 on your ironing surface right sides together. Match up the triangle points. 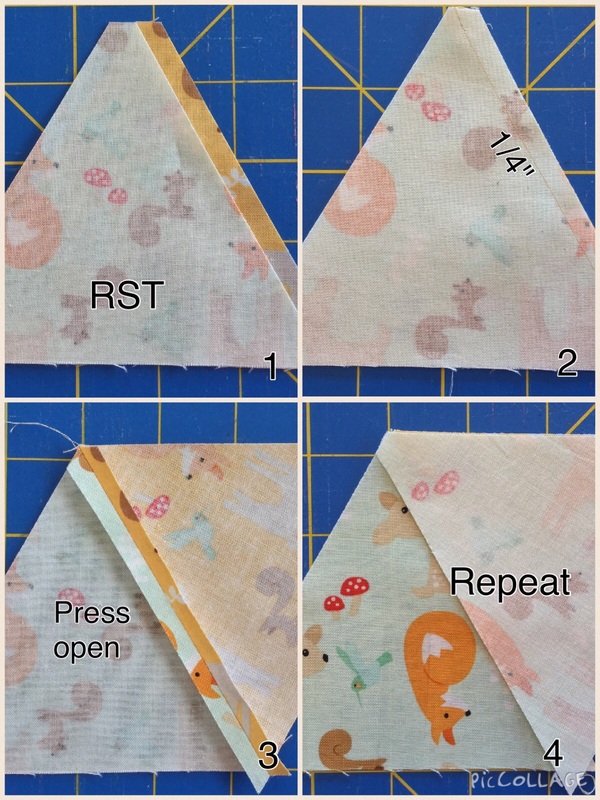 Insert a pin directly into the back of the triangle point on the top row. This is your ‘push pin’. 2. Now insert that same ‘push pin’ into the bottom row directly into its matching triangle point. 3. Push that pin onto the ironing surface to secure the row at that spot. 4. Place one pin on each side of the ‘push pin’. Remove the ‘push pin’. Do this for all of the triangle points in each row. 5. 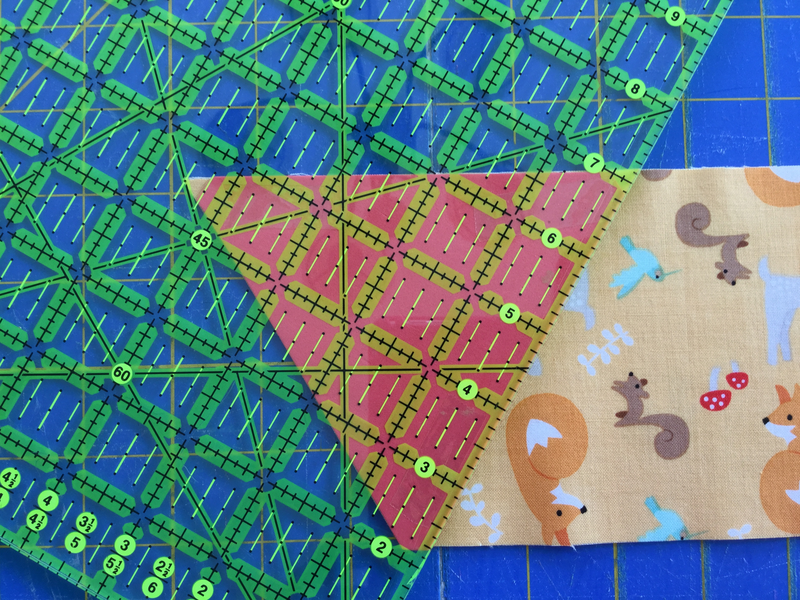 Sew a ¼” seam right through the intersecting point. Press your seams open. That looks like a pretty good matching point, don’t ya think? Yes! It really is that easy! Trim the side edges of the quilt top. 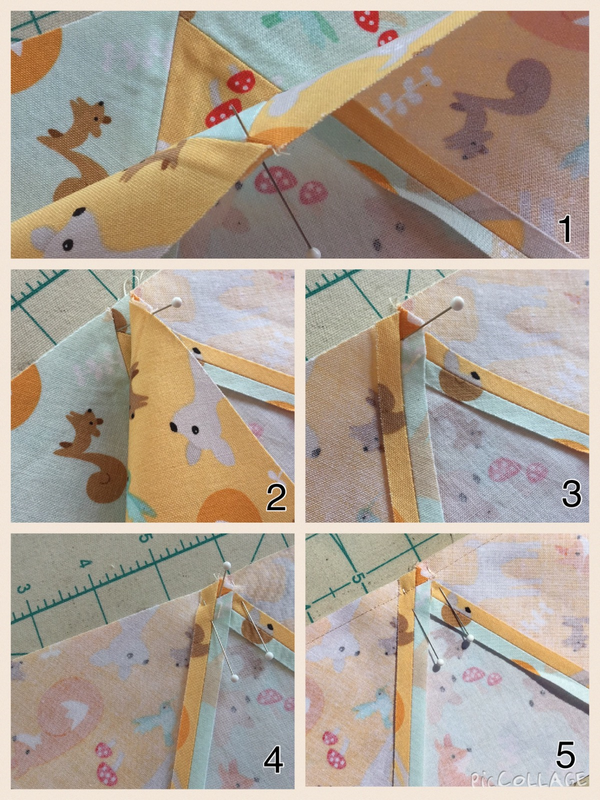 Make sure to leave a 1/4 “seam allowance from the triangle points on the sides to attach the binding. Quilt & Bind. 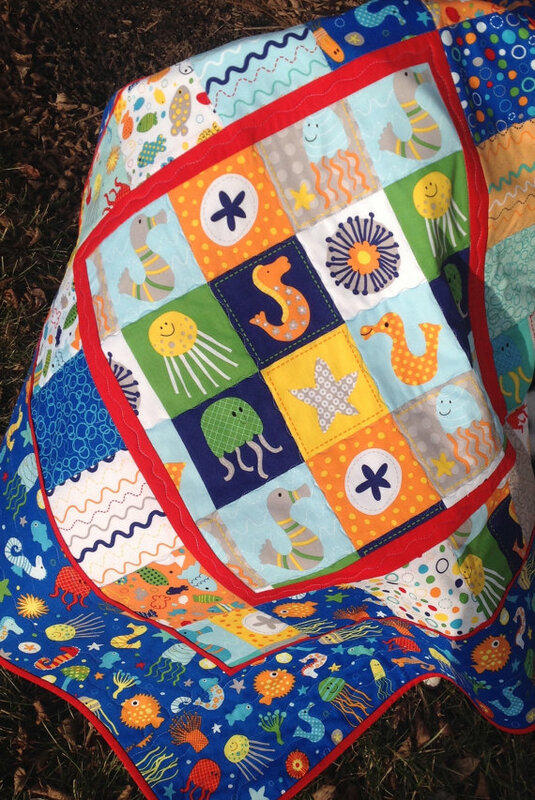 I want to give a shout out to my friend Isis, who did the fabulous quilting on the sample! If you’d like the complete kit featured in the post and a free copy of the pattern, it can be found in the Etsy shop. 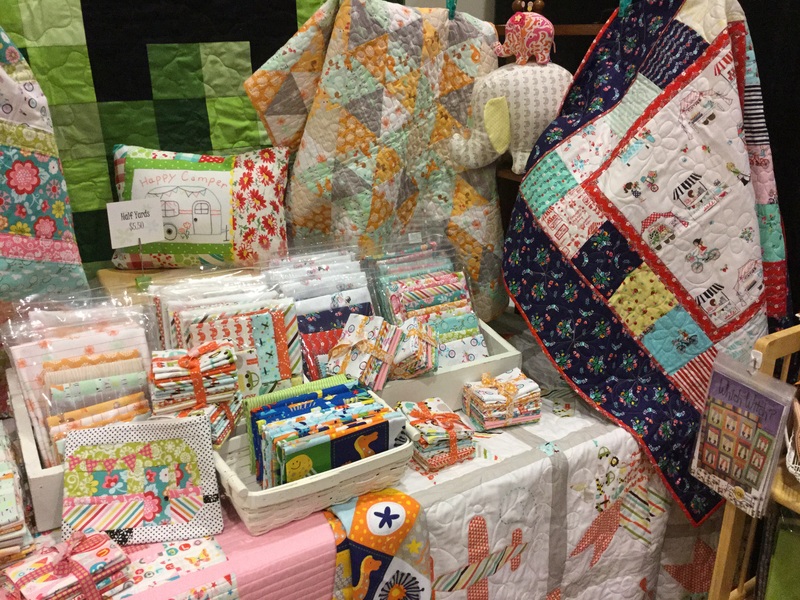 Each kit comes complete with quilt fabrics, binding and backing. I’ve made a resolution this year to hand make at least one shop sample a month. This can work out one of two ways…I’ll either be super prepared for quilt shows or I’ll be all sold out…either way it’s a win, right?! 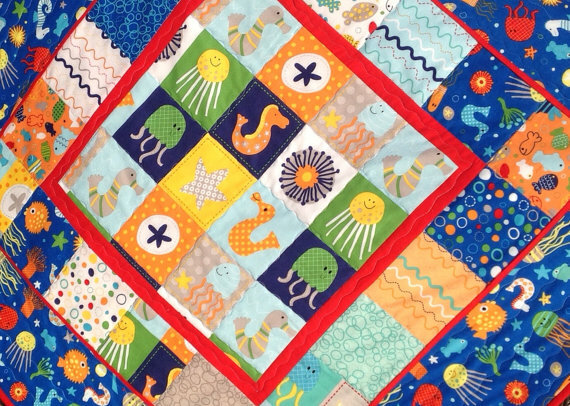 January’s hand made cuteness is a baby quilt made from the Riley Blake line called “In The Ocean“. 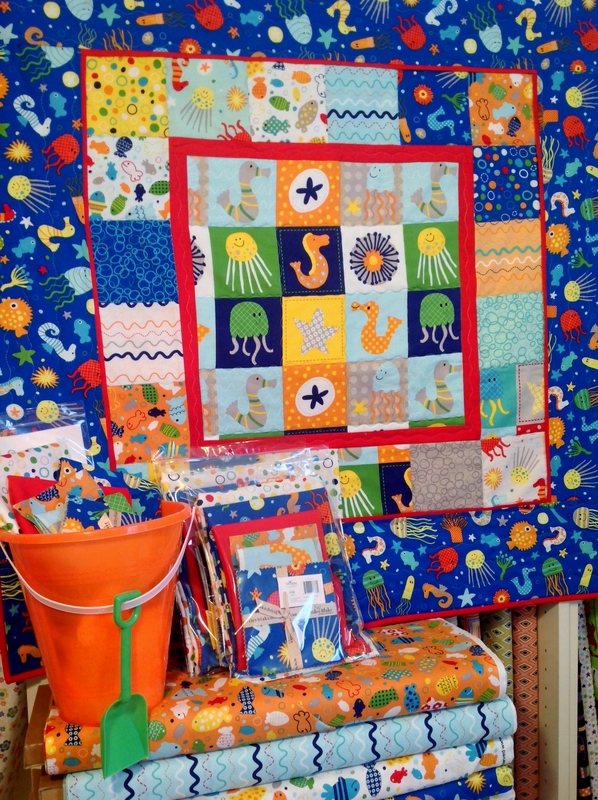 Schools of fishes, seahorses , smiling jellyfish, and mulit-colored bubbles will make baby’s room bright and playful. I used the panel fabric for the center. It features all the main characters for the quilt and framed it with a border and a flange in a Kona red called Lipstick. 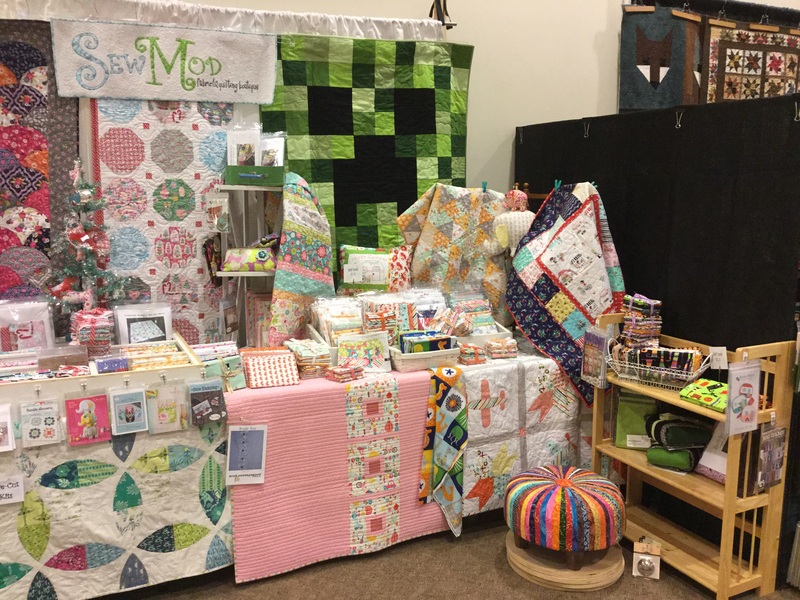 If this quilt kit actually makes it to the shows, It will be sold with the sand pail, but as for now, that’s just a shop display..it would be kinda hard to get that pail to the customers with cost effective shipping! Kit price is $40. That includes everything to make it, including top fabrics, binding, backing, pattern and is available in the SewModDesigns shop. If you’re looking for something simple, this one’s for you. I used one day to make it and one day to quilt it! This kit makes a perfect snuggle blankie for baby. Use it to throw on the floor for playtime or decor for the nursery. 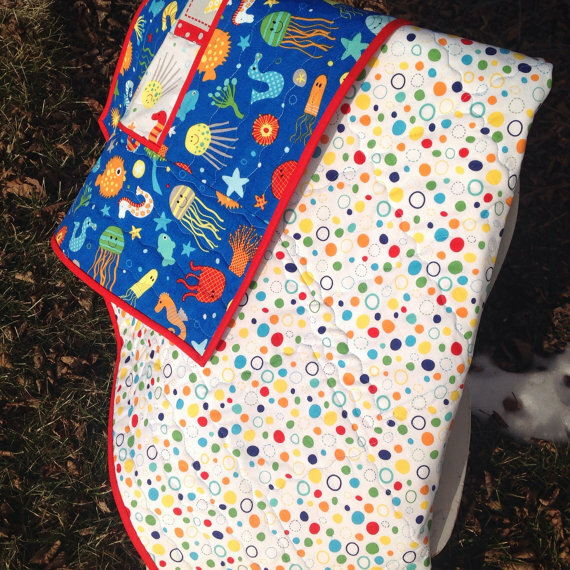 It’s small enough to take with you for a stroller blanket or use with the carrier. Have a baby shower to attend? 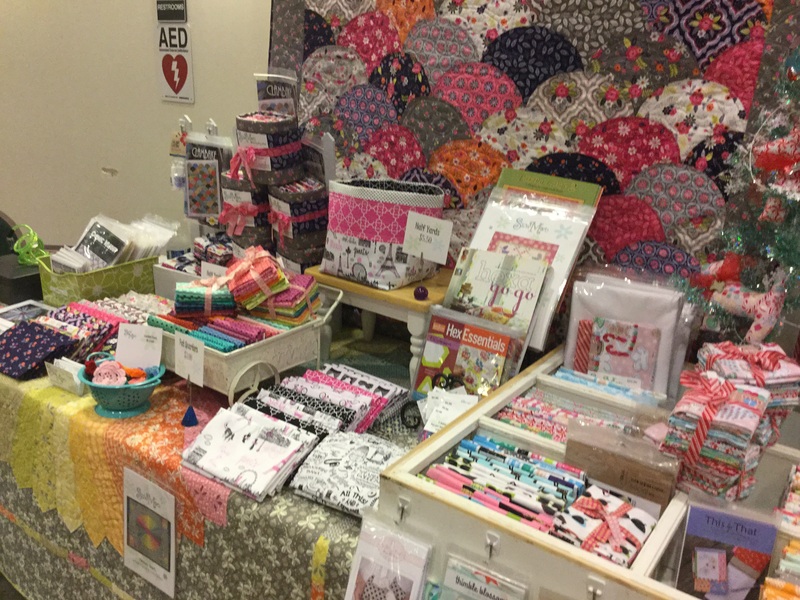 Bring handmade! 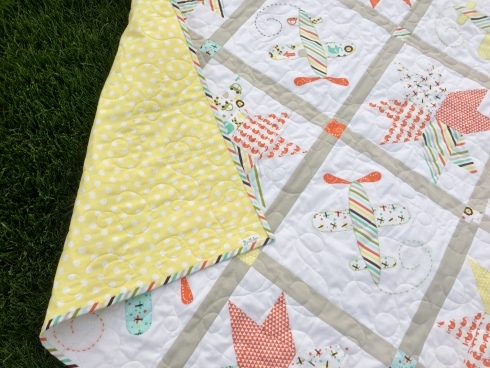 Or if you’re interested in purchasing the handmade quilt, it can be found in the SewModMakes shop!